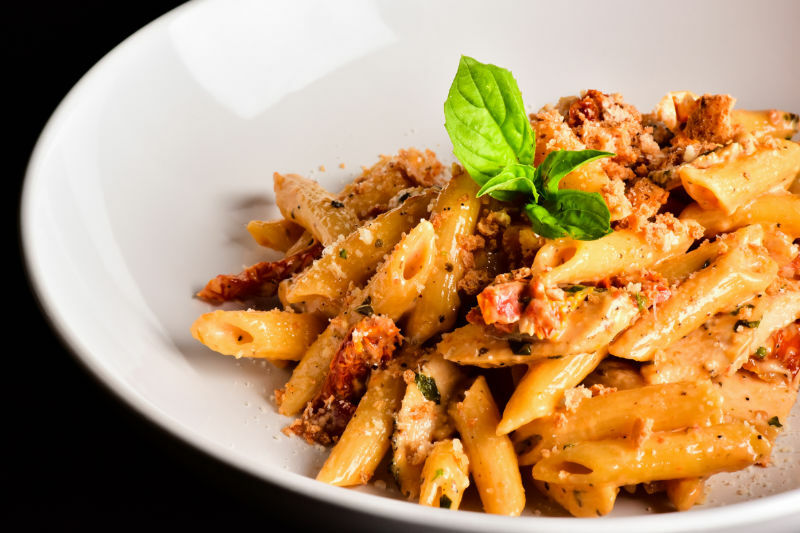 For us, summer has us dreaming of Tuscan vineyards and this delicious sun-dried tomato pasta recipe. This pasta recipe is so easy to whip up, requiring minimal effort and prep — perfect for a lazy summer day! One of our favorite parts of this recipe is the sun-dried tomato sauce. The sauce comes together in a blender, or food processor, and packs a flavorful punch. Unlike other sun-dried tomato pasta recipes, the tomatoes aren’t simply stirred into the pasta. Instead, the sun-dried tomatoes are puréed with some half and half, grated parmesan, and garlic. It’s a simple mixture that ends up coating the penne pasta that we use beautifully. You can also add grilled chicken, Italian sausage, or veggies like fresh spinach into this pasta; this sun-dried tomato pasta is easily customized to your taste and preferences. Simply cook your pasta according to the package instructions, then pour the sun-dried tomato sauce from the blender into the pan and give everything a good toss. A little more grated parmesan on top is all it needs before serving! Bring a pot of water to a boil. Once boiling, add the tablespoon of salt for the pasta as well as the dried pasta. Lower the heat to medium and allow the pasta to cook for as long as the package instructions suggest, or until your pasta is tender with a slight bite. Meanwhile, to the bowl of a food processor or blender, add the half and half, grated parmesan cheese, sun-dried tomatoes (with the oil), and garlic. Blend until the mixture is puréed and smooth. Add a pinch of salt and pepper, then blend again to combine. Taste test and add more salt or pepper if needed. Once the pasta is ready, drain the pasta water from the pot. Pour the sauce over the cooked pasta and toss to combine. Serve with some more freshly grated parmesan on top. Can a Weighted Blanket Help Reduce Anxiety? Can These Diet and Lifestyle Changes Prevent Prostate Cancer? Zee Entertainment takes a giant pioneering step – Builds a technology platform to satisfy 5 senses of the viewers to offer immersive customer experience! ZLiving.com is your guide to natural living and wellness, providing healthy recipes, motivating fitness tips, alternative remedies, and clean beauty advice. © 2018 Living Communications, Inc. All rights reserved.